I’m excited to have my poem “Vacation” featured at Prodigal, nestled at the top with terrific work from Jeannie Vanasco, Emily Hoffman, Lisa Hiton, and many others. Check out samples of the full issue or head right to my poem. Michael Donhauser is an accomplished Austrian poet, essayist, and critic whose books date back nearly thirty years, but he is not widely known to English readers. It makes him a great candidate for Dichten—Burning Deck’s translation series, which brings this rich and varied collection, Of Things (first published in German nearly twenty years ago), to a needed new audience. 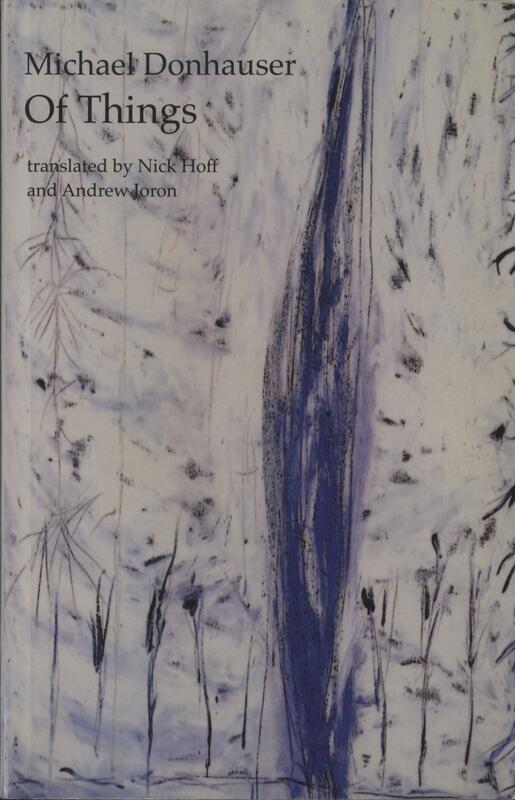 It’s a dizzyingly varied work, finely translated by Nick Hoff and Andrew Joron. It is philosophically poised but historically informed, personal, scientific, whimsical, and serious—showcasing a real rucksack of literary tools that Donhauser brings into the field with him to sketch, like the plein air painter, his subjects.